Chapel Hill is part of the North Carolina Research Triangle region and a close neighbor to the Town of Carrboro. The town is home to the University of North Carolina at Chapel Hill (UNC-Chapel Hill), which enrolls over 30,000 students and employs 12,000 staff. UNC-Chapel Hill’s large student population results in high volumes of pedestrian, bicycle, and transit commuter traffic, and safety is an ongoing concern. The Watch for Me NC program squares perfectly with the community’s commitment to enhancing road safety through education, outreach, and enforcement activities. 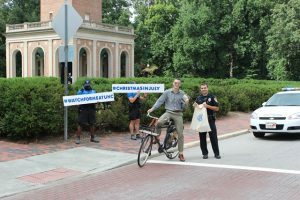 The Chapel Hill Police Department works closely with the Town of Chapel Hill staff, the University, and citizen advocacy groups such as the Bicycle Alliance of Chapel Hill. Marketing materials and public engagement has been central to the town’s strategy. Advertisements were placed on buses, and materials were distributed at schools, senior centers, driver’s education classes, libraries, Town Hall, community centers, hotels, and local businesses. Press releases were issued through town and law enforcement websites and social media. As part of the UNC-Chapel Hill effort to improve safety, University officials targeted education not only to students but also to UNC-Chapel Hill staff. A public policy student group created and implemented a curriculum to educate elementary and middle school students on bicycle and pedestrian safety. Watch for Me NC’s UNC-Chapel Hill partners distributed materials at campus events and conducted educational awareness activities at busy intersections. Further Watch for Me NC messaging took place at Back to School Nights and Parent Teacher Association open houses in Chapel Hill. Partners presented at crossing guard trainings and at several driver’s education courses. In collaboration with Safe Kids, the Watch for Me NC program led a pedestrian safety video contest for middle school students. Monthly enforcement activities were conducted in Chapel Hill, combining education and awareness with warnings and citations. The Watch for Me NC program provided additional training to police officers. Police Sergeant Celisa Lehew was excited to see new collaboration between town planning, communications, and town engineering motivated by work on Watch for Me NC. These departments now meet biweekly to talk about pedestrian and bicycle issues, including needs for enforcement, training, education, and improved infrastructure. In addition, data collected through Watch for Me NC has been used by town departments in discussions on policies and ordinances related to safer bicycling and walking. Chapel Hill found more local support when discussing Watch for Me NC activities as part of an ongoing safety effort motivated by the new student enrollment at the University. The Watch for Me NC program repeats messaging and programs annually to engage this changing population. Enforcement sites were strategically selected based not only on crash data, but by leveraging town employee information and community input. Site suggestions were provided by the Bicycle Alliance of Chapel Hill, local walking groups, and transit drivers. Thank you to Assistant Chief of Police Celisa Lehew with the Chapel Hill Police Department for providing leadership, time, and expertise that contributed to the Watch for Me NC Campaign in Chapel Hill and the information in this profile.